Any date in the Gregorian calendar can be converted into a corresponding one in the Maya calendar system. A particular day, month, and year can be expressed as a Long Count date using baktun, katun, tun, uinal, and k’in units of time together with a Haab and a Tzolk’in calendar dates. Use this interactive tool to convert Gregorian calendar dates into the Maya calendar system. Find the meaning of each day in the Tzolk’in calendar system here. To convert a date, begin by selecting the month from the drop down menu, next type in the day and year. Click the Convert Button to view the corresponding Maya Long Count date, both visually and numerically. You can change the date by using the +1 and -1 buttons or enter in a new date and use the convert button again. You can enter a new date and press the Convert Button to convert any other date between 3000 BCE and 4000 CE. For BCE dates enter a negative year number. For example, November 26, 2360 BCE would be entered as November 26, -2360. The Maya calendar system records a series of recurring cycles of time based on the movements of the Sun, Moon, and planets. Any given date repeats at cyclic intervals, just as, for example, January 1st in the Gregorian calendar repeats every time the Earth completes a revolution around the Sun. A complete Maya Long Count cycle is 5,125 years long. 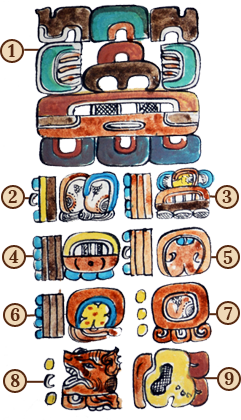 The Maya Long Count system establishes an absolute chronology in which any given date is unique, such as December 21, 2012, in the Gregorian system. The Long Count calendar keeps track of the days that have passed since the mythical starting date of the Maya creation, August 11, 3114 BCE. The basic unit of time is the day, or k’in. Lord of the Night (G8 in this example): A glyph that represents one the nine deities of the Maya Underworld.